If this keyword is set, the KML file is zipped into a KMZ file. This functionality is only available if you have installed the Open Source 7-Zip compression program to 7z.exe correctly in cgKML2KMZ. If you don't understand, please don't set this keyword! Written, 30 October 2012 by David W. Fanning. Added DRAWORDER keyword and fixed a typo concerning MISSING_VALUE. 31 Oct 2012. DWF. Fixed a problem that was causing floating underflow warnings to be thrown. 5 Nov 2012. DWF. Images with values between 0 and 255 were not getting scaled properly. Fixed. 30 Nov 2012. DWF. Added a FlyTo keyword to allow the user to fly to a particular location on the Earth. 31 Dec 2012. DWF. Was not handling 24- or 32-bit images correctly, nor was the MISSING_COLOR keyword being interpreted correctly when expressed as a color string. 20 Feb 2013. DWF. 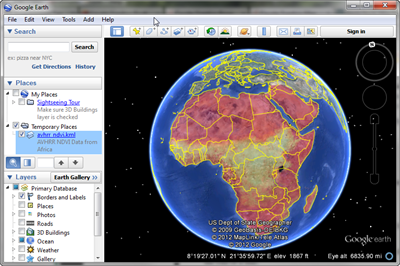 Have been writing the absolute path to the image file into the KML file, when I should have been using a relative path. 22 Feb 2013. DWF. Problem with the MISSING keyword. Fixed. 14 Mar 2013. DWF.